The picture book, Silence, beautifully illustrated by K.C. Snider, is a completely wordless book. The lifelike artwork -- nearly photographic -- takes us a through a year in the life of a golden manteled ground squirrel. We follow him through his daily life and adventures at Crater Lake National Park. Having been to Crater Lake in the early hours of dawn, I believe the choice of Silence for a title, is most certainly appropriate. The natural beauty of Crater Lake makes you want to hold your breath and not breathe a word. Wordless books are perfect for pre-readers. They can enjoy the beauty of the illustrations and not be distracted by the printed word. Children are free to put in their own interpretation, in their own words, in response to such questions as: “What do you see in the picture?” “What is he doing now?” "What do you think he’s thinking as he. . .?” "What do you think he'll do now?" The imaginative story ideas are as endless as the children describing their stories. It will be just as much fun for the parent or teacher to see what they come up with as it will be for the kids. K.C. Snider, an honors graduate from the School of Art in Eugene, Oregon, spent two years creating the artwork for this book. Ms. Snider is an award-winning illustrator of over forty children's books. Her Western Fine Art has won prestigious art awards and her illustrations for children's books have also won numerous literary awards. This is her first "solo" book -- entirely written and illustrated -- wholly created by Ms. Snider. Everyone would enjoy this book and could create their own word story while appreciating the amazing artwork. 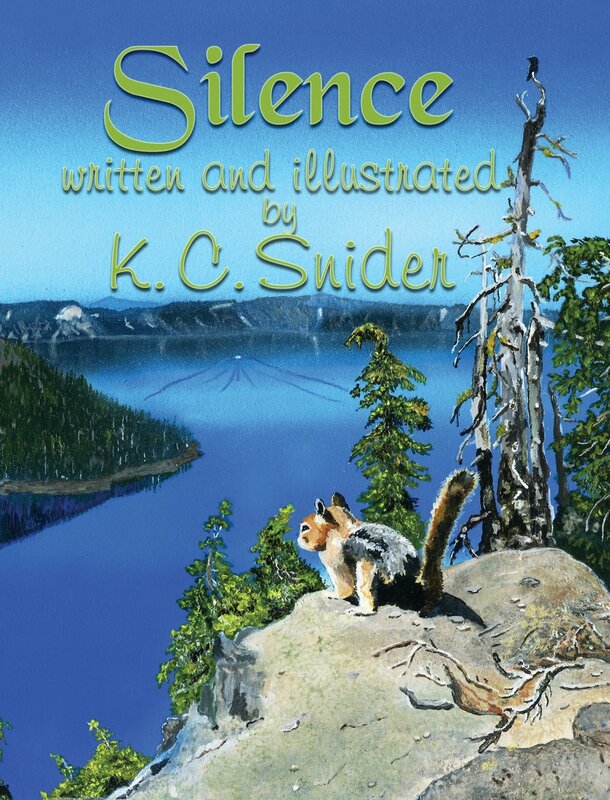 "Share the most inspiring clear blue lake in the world with a golden mantled ground squirrel as he meets animal friends and explores the wonders of Crater Lake National Park. From Rim Village, Wizard Island, to boat rides around the lake, past Phantom Ship, fishing with kids, and more, the ground squirrel leads you on a wordless journey where you can interpret the story. Suggested age for readers: for all ages." Available from Amazon, Barnes and Noble and other quality online bookstores. With art like K.C. Snider words are unnecessary. Thanks Margot, wishing K.C. much success with this lovely book! It sounds beautiful. That book should stay in print for decades. Hi Jan, yes it's very beautiful artwork -- looks like photographic work. Very nice. Thank you for the review, Penny. The artwork is fabulous. Congrats to KC on her first solo book. Perfect. Hi Donna, Thanks for your support and comments. It's a beautiful book. Love this book. I reviewed it on my site, too, and told my friend who has photographed this area how beautiful KC's artwork is. It's amazing! Hi Margo, thanks for stopping by. I'm sure your daughter appreciated this beautiful wordless "storybook." Wishing K.C. much success. Gorgeous review of a gorgeous book. Many thanks! Hi Nancy, thanks so much for your kind words. This is an awesome book and I wish K.C. much deserved success.